Oftentimes — except in times of crisis — when one reads about a presidential visit to New Orleans, it’s heavy on food-related photoshoots. Barack Obama at Parkway Bakery and Tavern, George W. Bush at Dooky Chase and FDR at Antoine’s Restaurant are just a few examples. The man appears to have been a very picky eater. Unlike many politicians, he never publicly expressed a fondness for a specific New Orleans restaurant. One friend who attended his 90th birthday party called him more of a “meat and potatoes guy,” and it was reported his favorite foods while in the Oval Office included beef jerky, Butterfingers and pork rinds with Tabasco. His nearly lifelong relationship with New Orleans is — while not food-related — perhaps more authentic than any other president in history. Here are just some of his many connections. 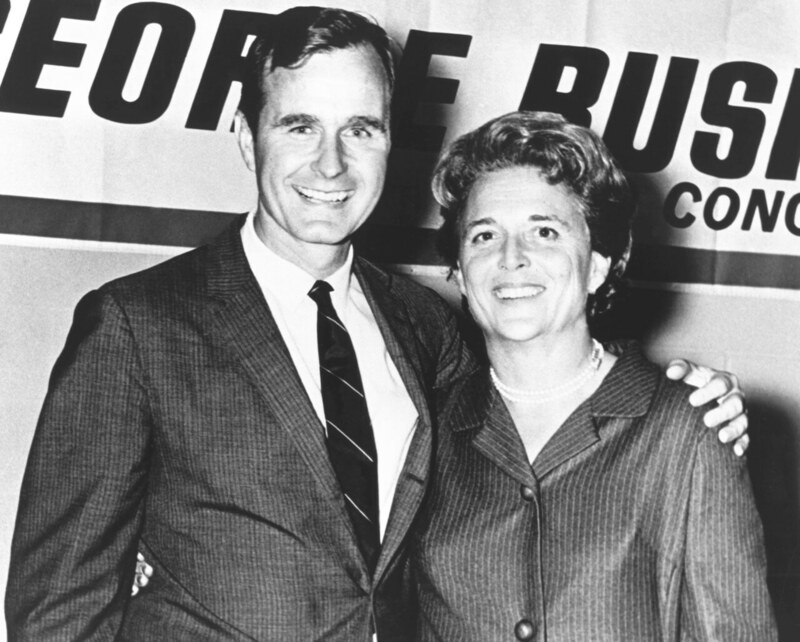 Bush grew up in Connecticut and — after serving during World War II as a pilot and graduating from Yale — he moved to Texas to enter the oil business. During the 1950s, he frequently zig-zagged across south Louisiana, acquiring drilling rights for his Texas-based onshore drilling company. Wanting to build an offshore rig, he visited New Orleans to learn about one that was recently developed. On Dec. 6, 1969 — close to entering his second term in the House of Representatives — Bush was invited to the Jung Hotel on Canal Street to introduce Vice President Spiro Agnew for his speech to the Southern Republican Conference. The Jung was no stranger to political gatherings in the 1960s and, today, it has been revitalized and is once again a beautiful place to stay, drink and eat. Only a little more than a month away from Election Day in 1980, Bush — now the Republican nominee for vice president — visited New Orleans to open a political campaign headquarters at 4041 Tulane Ave., less than a block from the corner of Tulane and South Carrollton avenues. In addition to that speech, he spoke downtown at the Hyatt Regency Hotel on Loyola Avenue, as well as at the Superdome — one of many appearances he’d made there during his life. His message: “Do you want a man who broke his word to you?” He was referring to President Jimmy Carter at the time, but that sentiment would come back to haunt him more than a decade later when he was unable to keep a promise he made during a much larger trip to New Orleans. But as vice president, he would visit the Crescent City several more times, including a visit in 1982 to address the massive Triennial Convention of the Episcopal Church at the Saenger Performing Arts Center (now Saenger Theatre) with South African Bishop Desmond Tutu. He was back again in 1984 to visit the World’s Fair, which made up much of today’s downtown Arts District, including the Riverwalk Marketplace and the Ernest N. Morial Convention Center. 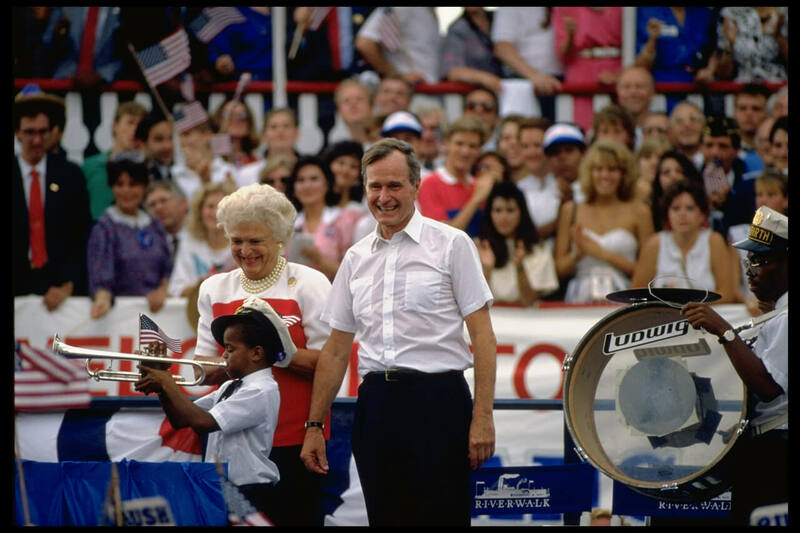 In the summer of 1988, Bush had his most significant moment with New Orleans when he arrived here on Aug. 16 to accept the Republican nomination for president. It remains the only national political convention to take place in the city. And New Orleans went all out to make this a special event, greeting delegates at the airport with a Dixieland band and hurricanes from Pat O’s. The soon-to-be nominee, however, arrived in the city in a more dramatic fashion, aboard the Steamboat Natchez. Landing at Spanish Plaza, he spilled the much-anticipated beans when he finally announced his running mate, but his best moment was still to come. Back in the Superdome, in front of a charged crowd, Bush brought his supporters to a roar with two of his most famous lines. Each would impact the remainder of his life. 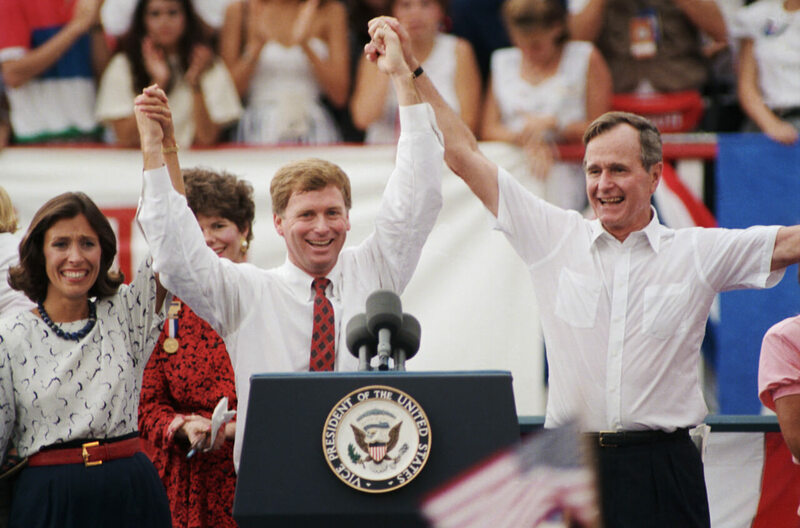 (Original Caption) 8/16/1988- New Orleans, LA- Vice President George Bush and Senator Dan Quayle of Indiana raise their arms together after Bush named him to be his vice presidential running mate 8/16. 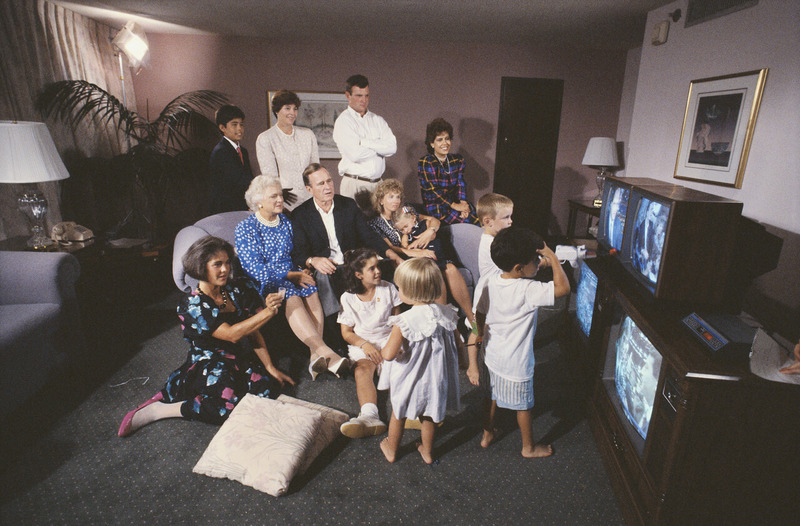 President Bush arrived in New Orleans on Sept. 8, 1989, for what was described as “a whirlwind four-hour tour.” He was criss-crossing the United States with the goal of obtaining grassroots support to pressure Congress to approve his $8 billion war on drugs. While in town he made two stops. At 11:30 a.m., he arrived at the Fairmont Hotel (now The Roosevelt Hotel) to speak to the U.S. Hispanic Chamber of Commerce. At 2 p.m., he arrived to address the National Baptist Convention at the Convention Center. 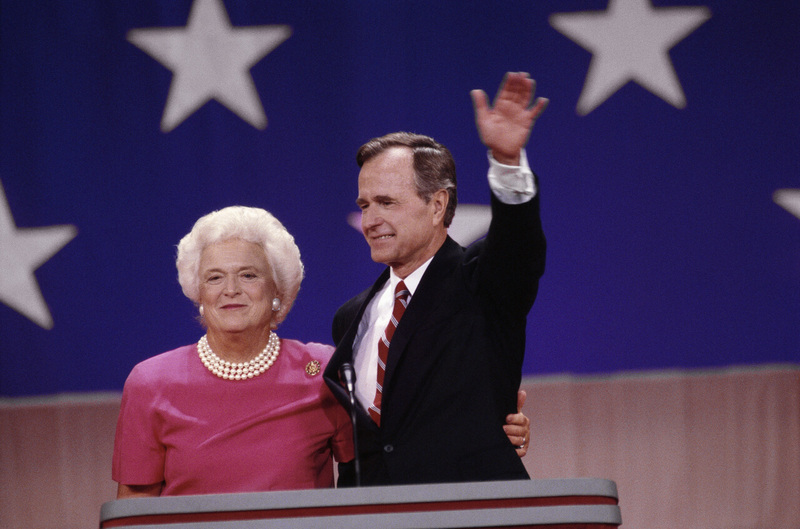 He didn’t have the opportunity to make a return trip to advocate for his policies in a second term because he was defeated in 1992 by William Jefferson Clinton. The reason was — in large part — because he was unable to keep the promise he made back here in 1988. To advance his agenda, he was forced to raise taxes. 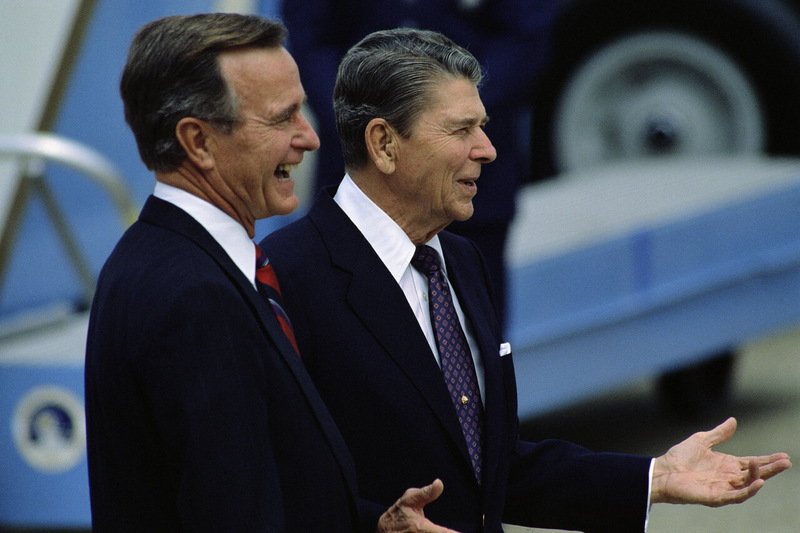 Decades later, his presidency is remembered in a more positive light, but at the time — just as he had implored New Orleanians in 1980 to hold Carter accountable for his empty words — voters could not forgive him. 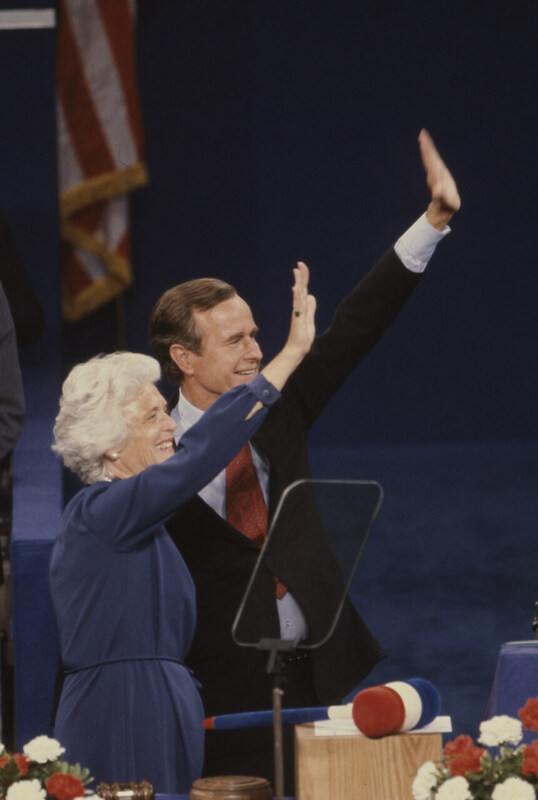 In the years following his presidency, Bush returned to New Orleans several more times — always as an example of the other set of words he spoke as he accepted the nomination. On the 60th anniversary of the attack on Pearl Harbor — Dec. 7, 2001 — he spoke at the dedication of the Pacific Wing of the National D-Day Museum, which is now the National World War II Museum. In his address, he drew parallels between the resolve we needed following the Japanese bombardment of Pearl Harbor, and the resolve the nation needed now, just months after 9-11. 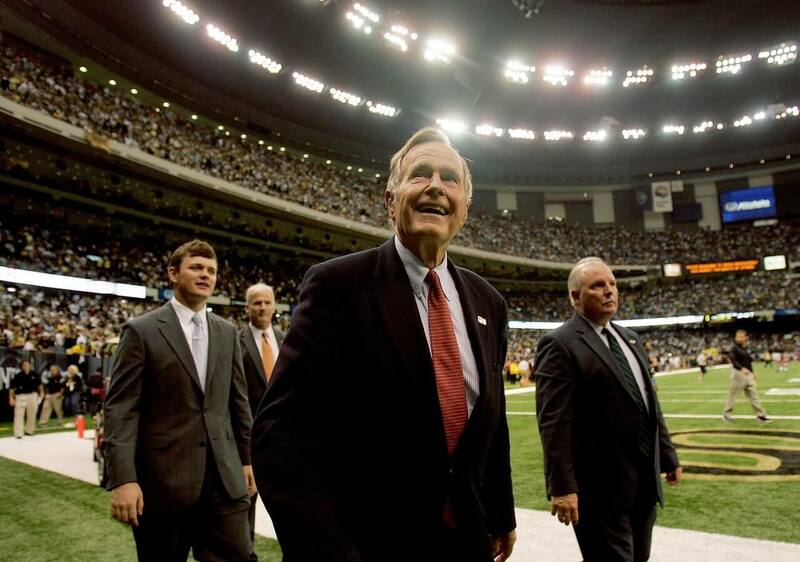 Bush would return to the Superdome for coin tosses — including for Super Bowl XXXVI, as well as the first one after the Superdome was reopened following Hurricane Katrina — but his largest impact would come in the years following the storm. 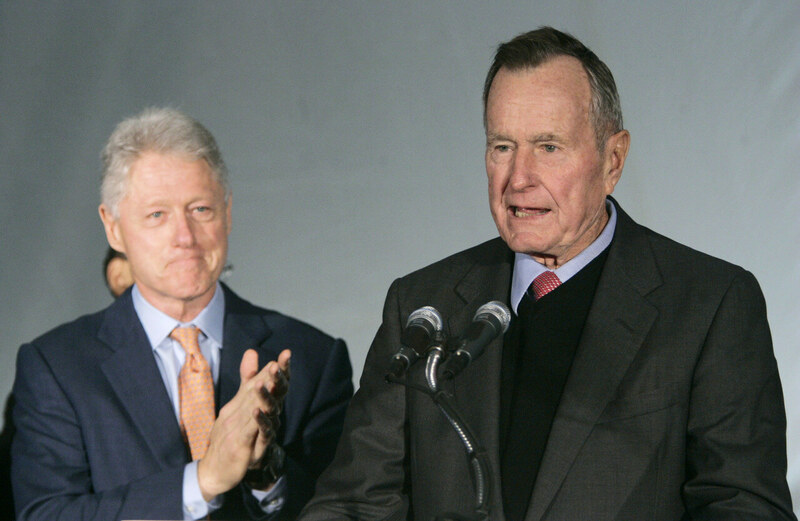 Presidents Bush and Clinton — once political rivals — collaborated to raise more than $90 million in grants to colleges, churches and state governments in storm-ravaged areas. They announced the grant awards at the University of New Orleans and gave a joint commencement speech at Tulane University. Bush would return several times to tour neighborhoods like Central City, where he visited the First Evangelist Baptist Church on Willow Street. Bush never called this improbable city home. But as Saints and Pelicans owner Gail Benson recently confirmed, he did love it. He may have not shown it by drooling over our food, but — more than any other president — his story was intertwined with ours.